Leading Manufacturer of cpvc pipes from Mumbai. CPVC Pipes & Fittings are manufactured from eco friendly and UV resistant CPVC compound.The pipes are highly resistant to abrasion, heat and fire. Ease in installation due to light -weight and cold welded joints. The pipes resist bacteria and chlorine present in water. CPVC Pipes are manufactured from eco friendly and uv resistant CPVC compound. The pipes are highly resistant to abrasion, heat and fire. Ease in installation due to light - weight and cold welded joints. The pipes resist bacteria and chlorine present in water. 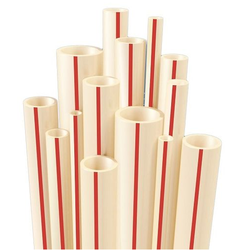 Looking for CPVC Pipes ?